They're calling it the "The Visa Cashless Challenge." The plan is to convince small business restaurants, cafés and food trucks to stop accepting cash, forcing customers to pay with credit cards or digital payments. "Visa will be awarding up to $500,000 to 50 eligible US-based small business food service owners who commit to joining the 100% cashless quest," the credit card company wrote in a press release. If a restaurant opts in, it'll get a $10,000 gift from Visa (V) to help pay for technology upgrades, the company said. Those tech upgrades could mean installing platforms that that accept payments from phones, smart watches or other devices. 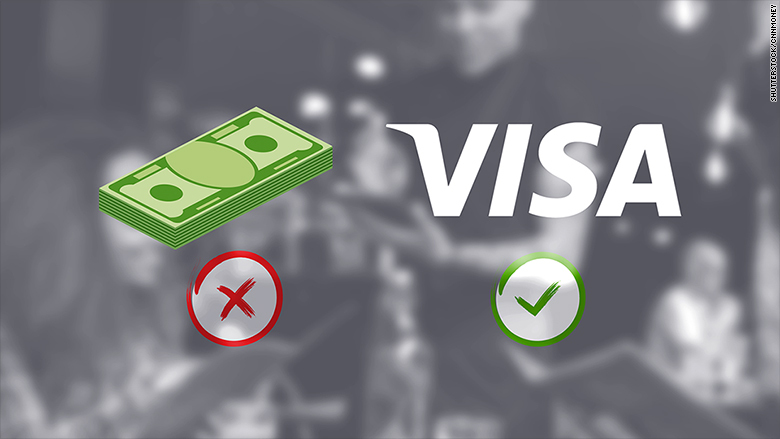 Visa has a clear incentive: Credit card companies charge processing fees and tack on other charges to businesses that accept their cards as payment. But those fees can cut painfully into the margins any small business, and it could even mean life or death for a small mom and pop shop. Marco Carabjo, a credit expert, wrote in a 2013 U.S. Small Business Administration blog post that fees for credit card transaction can cost businesses up to 5% of their revenue. Visa claims it has proof that cutting out cash can help small businesses. The company said it conducted a study that found if businesses in cities across the United States stop accepting cash, they could bring in billions more each year. In New York City alone, Visa says the study shows, "businesses could generate an additional $6.8 billion in revenue and save more than 186 million hours in labor" per year. That report has yet to be released. When asked if Visa will expand its "cashless" push to small businesses beyond the restaurant realm, Visa's merchant solutions head, Jack Forestell, said the the current program is "part of a broader strategy and set of initiatives." Forestell says Visa is betting that people want "freedom from carrying cash." Both the National Federation of Independent Business and the National Restaurant Association did not respond to CNNMoney's request for comment.